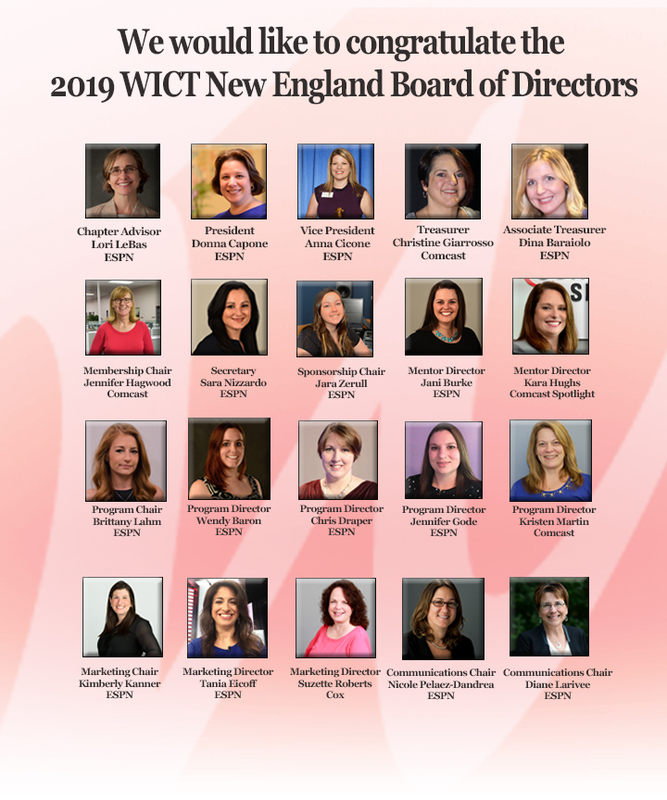 On behalf of the WICT New England Board hello and welcome to 2019! My name is Donna Capone and I am excited to start my second term as your chapter President. I’d like to first acknowledge that our membership is the lifeblood of our organization, so thank you for your continued support and engagement with WICT New England. Planning is underway to bring you thought-provoking programs based on your feedback. Our year kicks off with our first session on February 5th: “Breakfast of Champions: Adapt to Change in the Workplace with Confidence”. There are various events in the works which include a webinar series with Joy Kacik. Additionally, we are now taking applications for our popular Mentoring Program. We want to make sure you are taking advantage of every member benefit and hope to accomplish “connecting” you to your peers, your industry and everything around you. Finally, the WICT New England chapter board is excited to introduce new leadership – a group of individuals who share a commitment to creating learning opportunities for personal and professional growth. Please take a moment to learn more about our chapter’s board by visiting our website, http://wictnewengland.org/. We look forward to a productive year of connections. Please let us know if you have any questions about your membership.